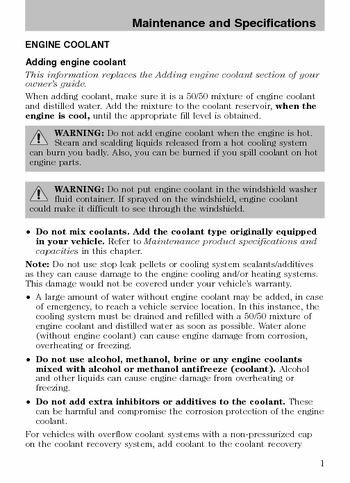 This information replaces the Adding engine coolant section your, when adding coolant, make sure it is a 50/50 mixture engine coolant, engine is cool, until the appropriate fill level obtained, wARNING: Do not add engine coolant when engine hot. Steam and scalding liquids released from hot cooling system, wARNING: Do not put engine coolant windshield washer, could make it difficult to see through windshield, note: Do not use stop leak pellets cooling system sealants/additives. As they can cause damage to the engine cooling and/or heating systems, this damage would not be covered under your vehicle's warranty, a large amount of water without engine coolant may be added, case, of emergency, to reach a vehicle service location. Cooling system must be drained and refilled with 50/50 mixture, engine coolant and distilled water as soon possible, (without engine coolant) can cause engine damage corrosion, and other liquids can cause engine damage overheating. Can be harmful and compromise the corrosion protection engine, for vehicles with overflow coolant systems with non-pressurized cap, on the coolant recovery system, add coolant coolant recovery, reservoir when the engine is cool. Water to the FULL COLD” level, coolant degas system with a pressurized cap, or if it necessary, remove the coolant pressure relief cap on the radiator vehicle with, an overflow system, follow these steps add engine coolant. WARNING: To reduce the risk of personal injury, make sure, engine is cool before unscrewing the coolant pressure relief cap, the cooling system is under pressure; steam and hot liquid can come, out forcefully when the cap loosened slightly. Add the proper mixture of coolant and water to cooling system by, pressure relief cap on the coolant reservoir (a translucent plastic bottle), slowly turn cap counterclockwise (left) until pressure begins release, cloth to turn it counterclockwise remove cap. Within the COLD FILL RANGE” or the FULL COLD” level, radiator until the coolant is visible and radiator almost full, after any coolant has been added, check coolant concentration (refer, (protection to drain some coolant adjust. Whenever coolant has been added, the coolant level coolant, reservoir should be checked the next few times you drive vehicle, necessary, add enough 50/50 concentration engine coolant, distilled water to bring the liquid level proper level. Month, have your authorized dealer check engine cooling system, your cooling system may have a leak, level of coolant can result in engine overheating possible engine, después de agregar cualquier líquido refrigerante, revise la concentración. De líquido refrigerante (consulte Revisión del líquido refrigerante del, drene un poco de líquido refrigerante y ajuste la concentración, posible que se tengan que efectuar varios drenajes y adiciones para, obtener una concentración de líquido refrigerante 50/50. Cada vez que se agregue líquido refrigerante, el nivel de éste en el, depósito del líquido refrigerante se debe revisar las próximas veces que, de líquido refrigerante del motor y agua destilada para que el nivel, del líquido llegue al punto apropiado. Del motor por mes, pida a su distribuidor autorizado que revise el, refrigerante bajo puede ocasionar un sobrecalentamiento del motor, además de posibles daños éste.